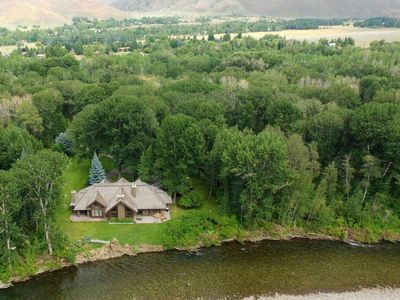 The Wood Riverfront Estate is a multimillion dollar property several acres of paradise, now available for rental to respectful, responsible guests who plan to visit to the Sun Valley area. 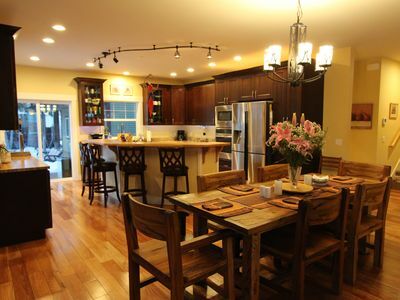 This sprawling 2 story home has over 5000 square feet of living space with beautiful finishes and decor throughout. This home is also pet friendly, on a case by case basis. Please contact us before booking this home online if you might have any dogs in your group. Also, please note that this exquisite home is intended for mature people who will treat it with dignity. Groups which include guests under 25 years old must contact us before booking to discuss your group dynamics, and receive approval to rent the home. Parties and gatherings are not allowed, unless discussed and agreed to in writing prior to the reservation being made. 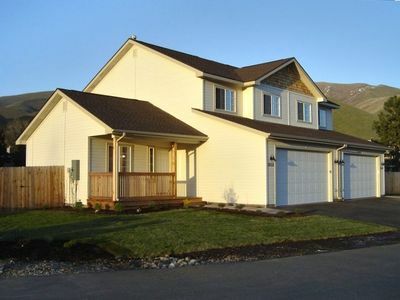 This large house has 4 true master bedroom suites, each with its own private bathroom. There are 3 living areas, one of which has a sleeper sofa and private bathroom, allowing it to function as a 5th bedroom. There is also a fitness room and greenhouse, in case you need some more space to explore or some privacy from the rest of your group. 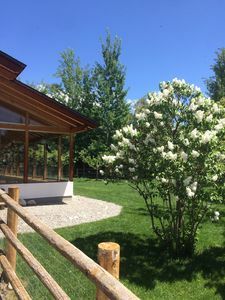 The outdoor space is wonderful in any season. 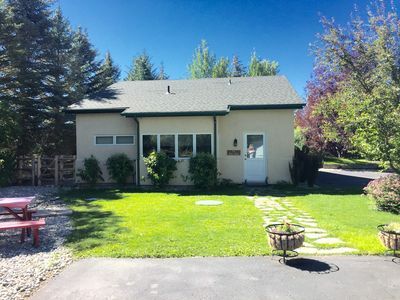 Winter guests will love the massive flat yard, ideal for snowmen, snow angels, or even a little snowshoeing adventure exploring the grounds. In summer, the land becomes even more special, as the Wood River fills with snow-meltwater to provide you with the hypnotic sound of rushing water, while the grass and mature trees spring to life creating a setting that is hard to duplicate. 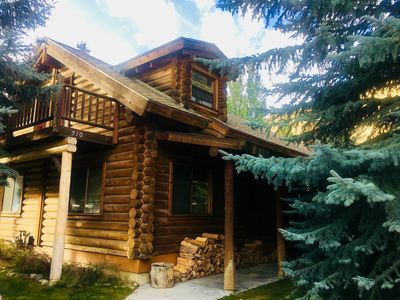 Though there is so much beauty to explore in and around Sun Valley, this piece of land is all you might need to make loads of happy memories. 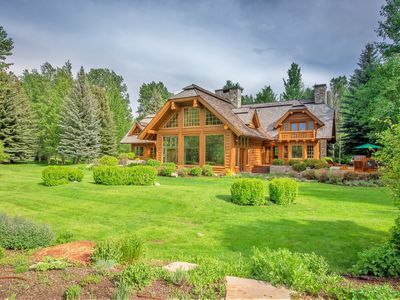 When you enter this home, you'll immediately be struck by the impressive scale of the home. Straight ahead you'll see the Great Room with a large fireplace as the focal point. The foyer has a grand winding staircase leading to the upper level landing, which overlooks the great room. Higher still over the landing is the apex of the roof, soaring 30 plus feet over the main level. This gives the great room a very spacious feel. The Great Room has very high quality furniture in addition to the beautiful floor to ceiling fireplace. 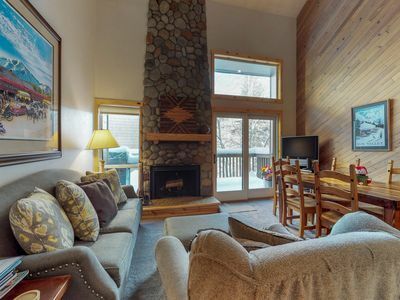 You can also make use of the bar and will enjoy views of the Wood River through the plentiful windows. Head for the Kitchen. This room will impress as well, and should satisfy demanding chefs. Professional grade appliances include an oversized fridge, dual ovens, and a gas range that will leave you wanting to renovate your kitchen back home. There are two ovens, two sinks, and two dishwashers. This kitchen is so big that the large center island looks a bit modest. There are bar seats for 3, so that you can keep your chefs company if you like. The formal dining room has a large round table with seating for 8 that allows the whole group to engage one another while sharing large meals, or maybe playing some cards after dinner. 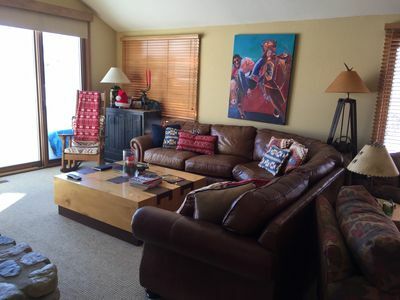 In addition to the Great Room, the ground floor of this home also has 2 more living rooms. 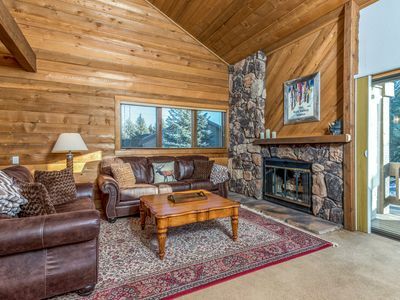 The first is a light and bright room with a bank of large windows that provide you with views of the Wood River. 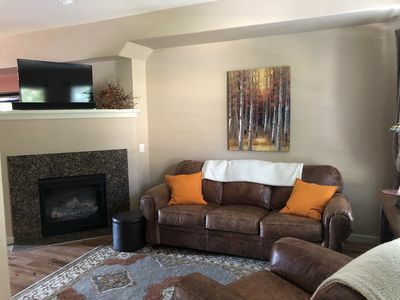 It has comfy furniture surrounding another beautiful fireplace and entertainment center with TV. This room has patio access as well as a round glass table that serves well as a secondary dining area or game table. The other main level living room also has nice views and comfy furniture surrounding a TV, but this room also has a bank of built in shelves and counters which give it the feel of a study. In fact, there are two desk spots in this room that will help if you must get some work done while on vacation. This room also has a sleeper sofa and private bathroom, and can be closed off for privacy, allowing it to serve as a 5th bedroom. With all these living and dining areas, a massive kitchen, plus the workout room and greenhouse, the main level of this home does not lack for space or function. The main level of the home also includes the master suite. It is a large room with a beautiful King size bed and tray ceiling. The master has a walk in closet so large that it could be called a dressing room. The master bathroom has two separate vanities, a big Jacuzzi tub, and separate shower. There's plenty of room for a comfy armchair by the large fireplace, which is not usable for normal fires, but candles are okay and will set a similar ambiance. The master suite also has direct access to a covered patio and the yard. When you head upstairs, the landing splits the home in half, providing good separation of space. The 3 upstairs bedrooms all have their own private bathroom. The first upper bedroom has a King bed, sitting area, and views of the Wood River. 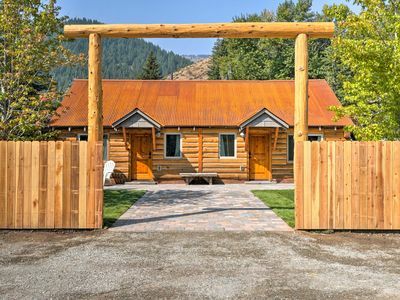 The next has a Queen bed, sitting area, and views of the Wood River. The third has 2 Twin beds, a sitting area, and nice views of the yard. The location is convenient. You're far enough from highway 75 that you don't have to worry about road noise. Just relax and enjoy the sound of the river! 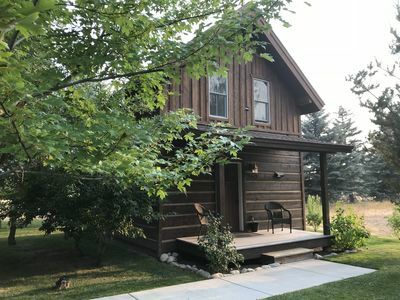 That said, you can hop on the highway pretty quickly, and will have a short, straight, easy drive of about 7 miles north to Ketchum, Sun Valley, Elkhorn, the River Run ski area base, and so much more. 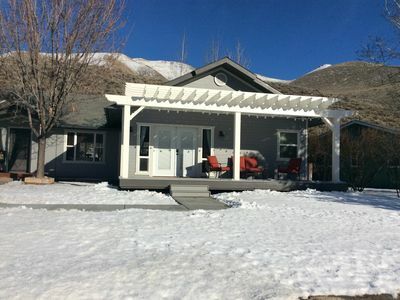 The center of the charming town of Hailey is just 5 miles to the south, giving you another area with shopping and dining options to choose from. 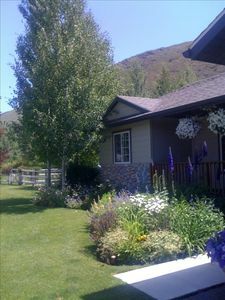 When you rent this home, you'll have a very special place to call home during your Sun Valley vacation. Its a very nice home on a very special piece of land. Please contact us with any questions. Our vacation rental specialists are standing by 7 days a week to help you. 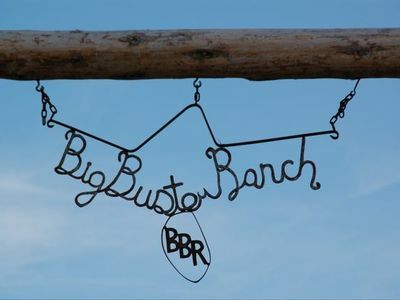 If you're a respectful group and ready to make your reservation, please book online and we will be in touch to confirm the details of your reservation and go over all pertinent details of the reservation process. 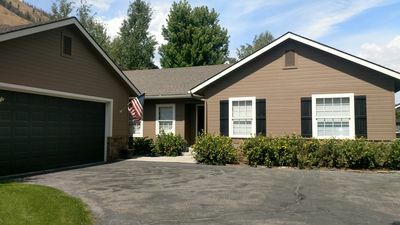 Warm condo just steps from pool, hot tub, tennis, and golf! Urbanism Bunglalow close to town and trails for 2-4 people. 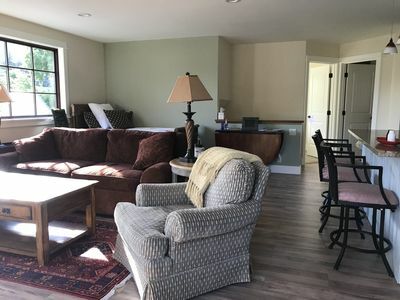 Cozy family friendly condo with private spa. Minutes from Dollar and Baldy Mtn. Welcoming New Apartment. Great for a family, small group, or individuals. 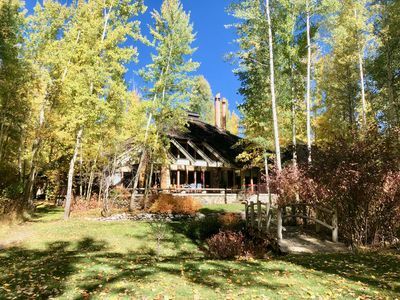 Beautiful home on the Big Wood River south of Ketchum in an aspen forest. 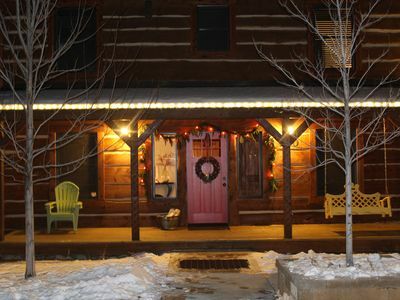 Clean and Cozy Townhouse in the heart of the Wood River Valley. NEW! 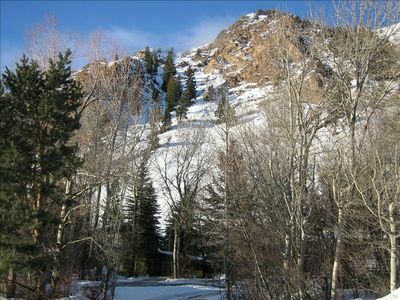 The Cabin at Cold Springs w/ Red Cliff Views!